Hi everyone! 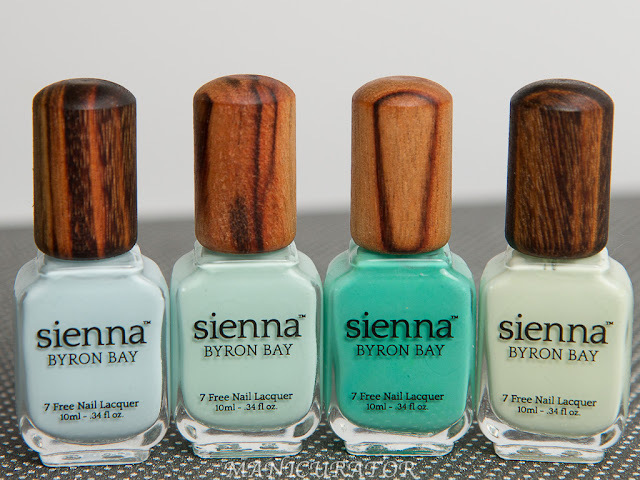 Remember I showed you two UNT shades in my last two posts (Lost in Paradise and Sand Castle)? 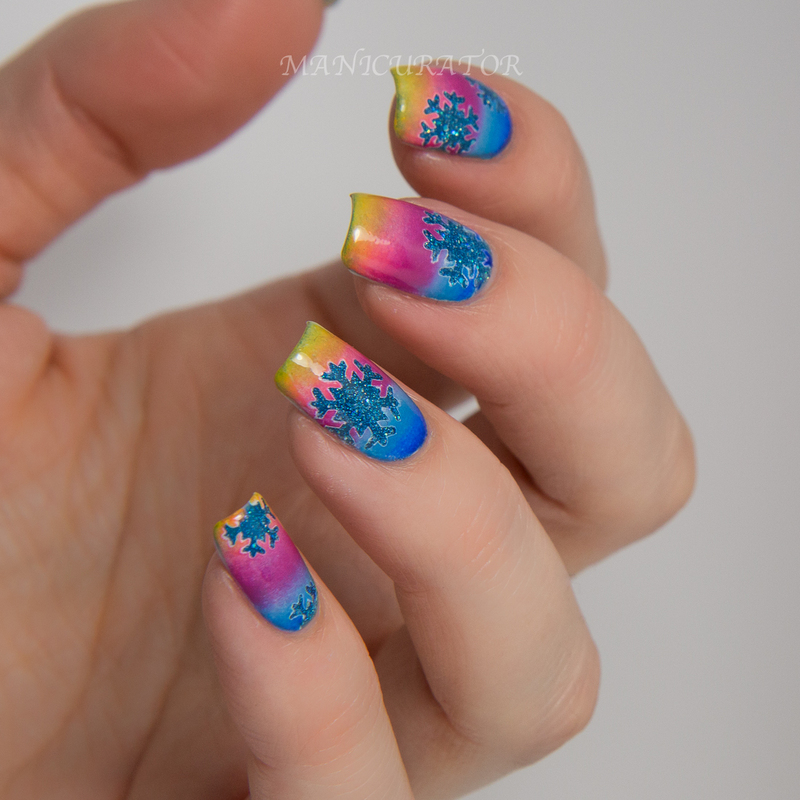 Well, I created this Winter Sunset Snowflake Nail Art design with Lost in Paradise and 8 KBShimmer cremes. I'm thrilled how this turned out. I knew I wanted to create a Winter Nail Art scene with this UNT shade Lost In Paradise from Live Love Polish. Yes, this one is going to be picture heavy, I just found it that pretty, had a hard time deleting any pics! UNT Lost in Paradise (reviewed here) served as my base color. 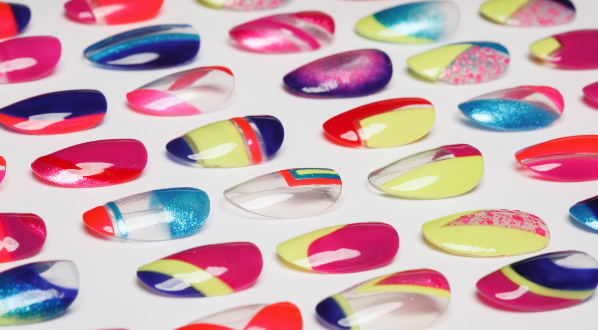 Two-three coats then top coat with KBShimmer Clearly on Top. After top coat was dry I added snowflake vinyl stickers from KBShimmer in their LE Winter Holiday set. I sponged a white polish over the entire nail (except for where the snowflakes were stuck on!). 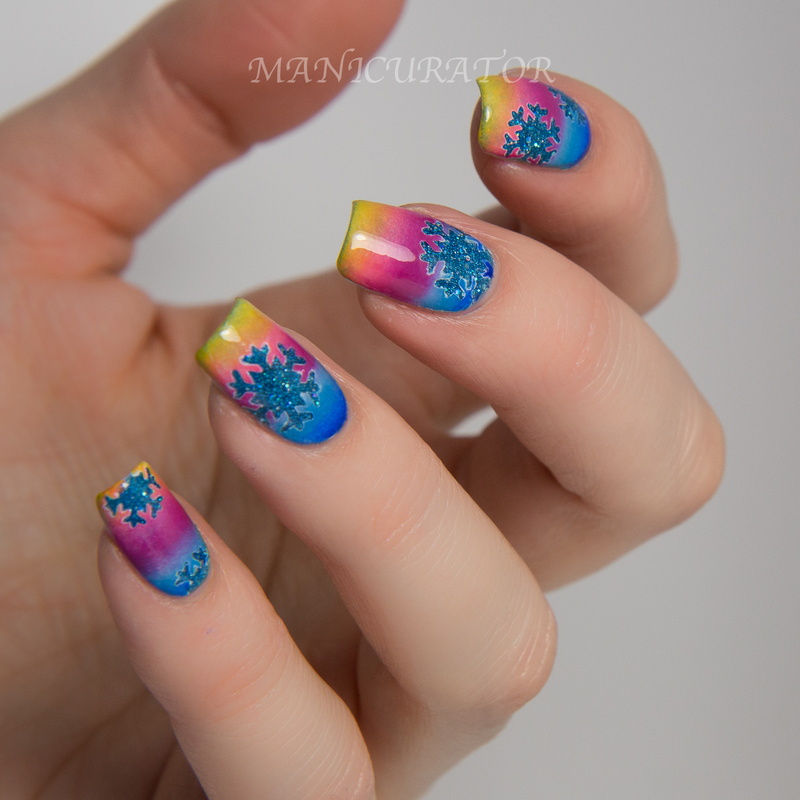 On top of the white I sponged on a gradient of EIGHT amazing KBShimmer cremes. 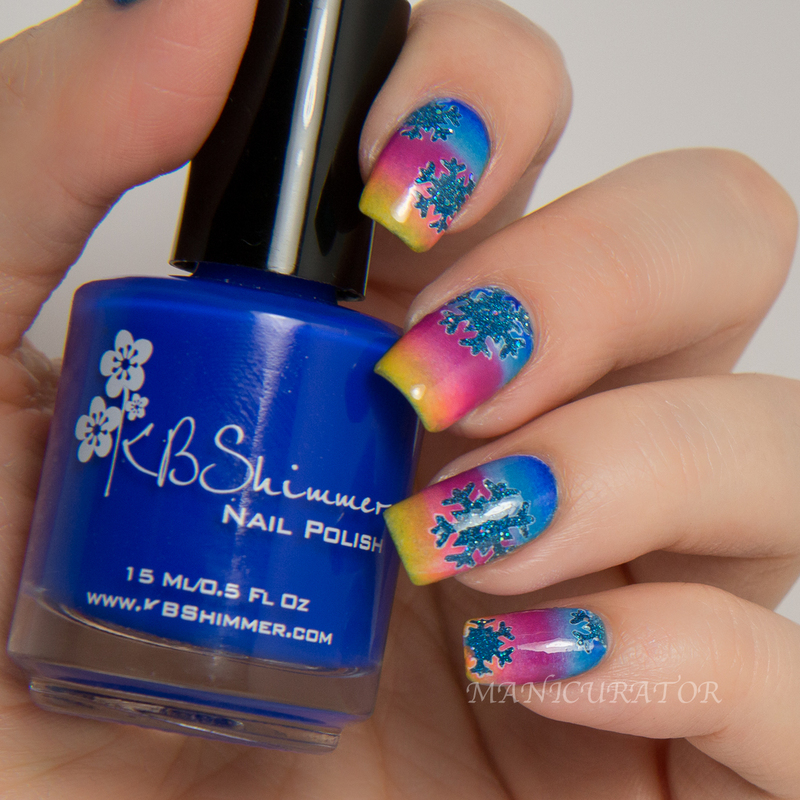 From cuticle to tip these are the KBShimmer shades I used: Right As Reign, Low And Be Bold, Sky, Hugs And Wishes, Life Rose On, Let's Not Coral, You're So Shelfish and Chick Me Out. 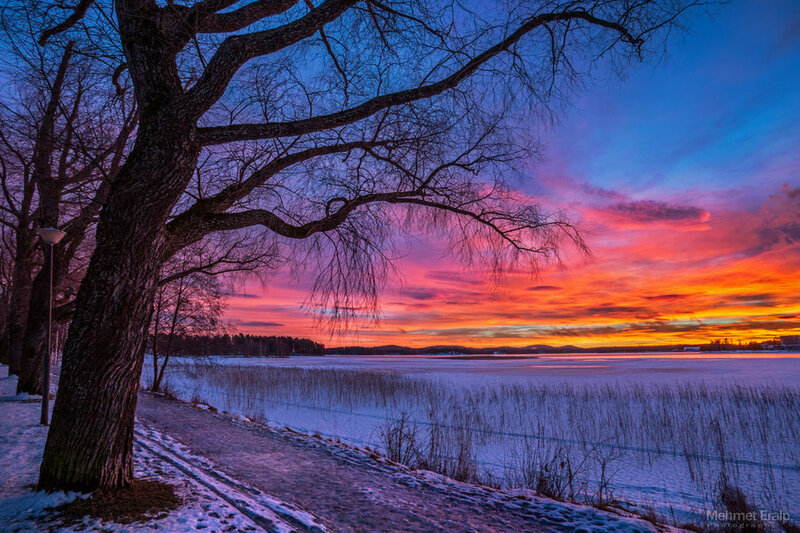 Here's the stunning photo I found which inspired my sunset! 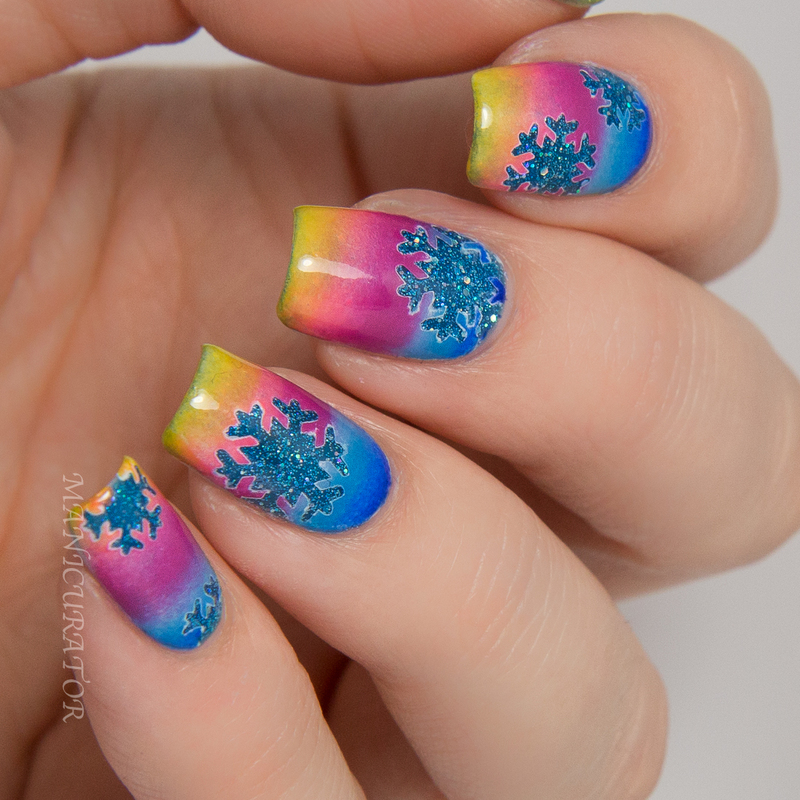 After I was happy with how the gradient looked, I peeled up each of the vinyl snowflakes and top coated once again! These looked so super pretty and fun in real life. I love how the snowflakes are paired with such bright typically non-winterish shades. These just made me feel happy! 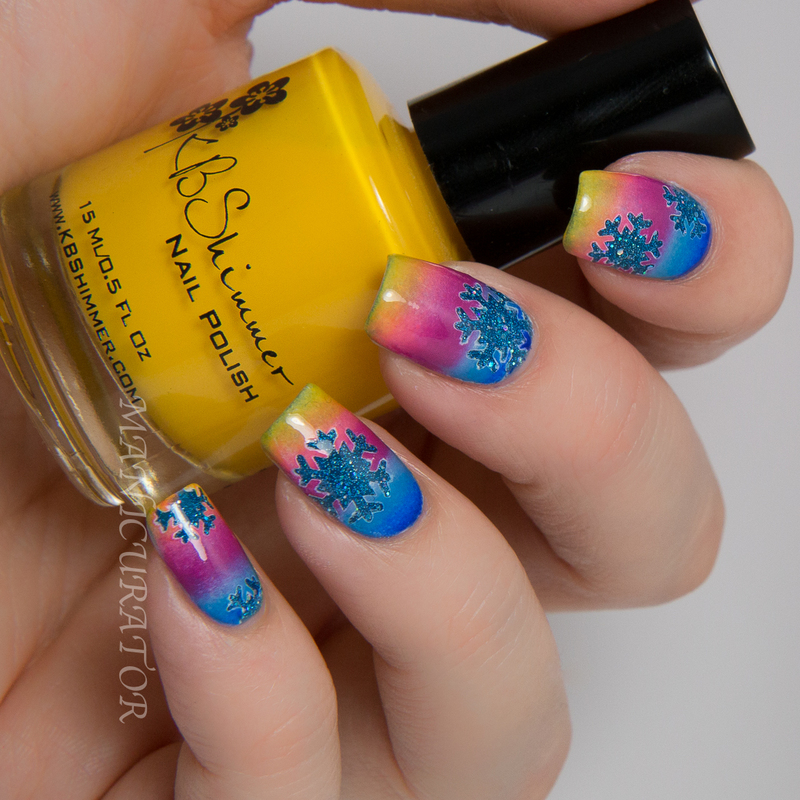 I know you sure didn't need to see additional photos of this mani, but wanted to show off some of the perfect KBShimmer shades as well! This one is Life Rose On. OKAY! 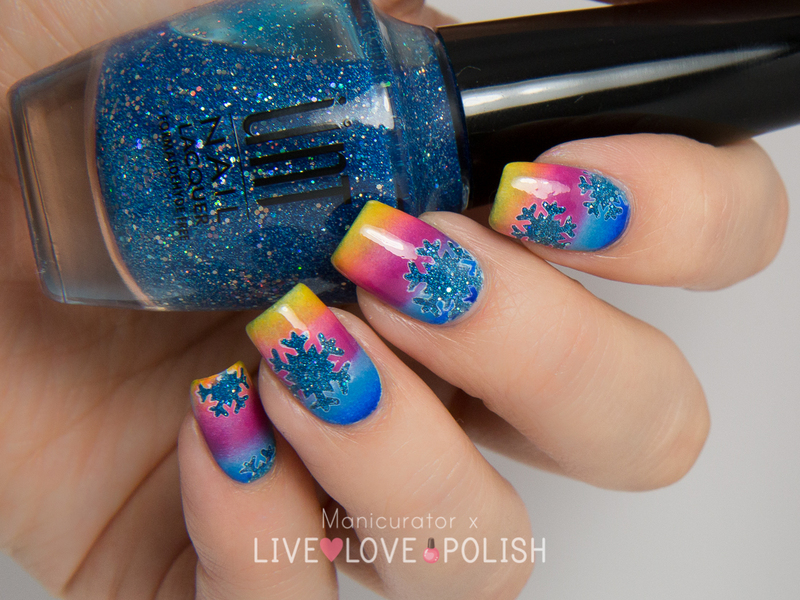 So there you have it, my epically long post with glitter, snowflakes and a bright colorful sunset! Are you a fan? This is gorgeous!! I love the colors!! Beautiful! I love seeing bright colors for winter. This is absolutely amazing. 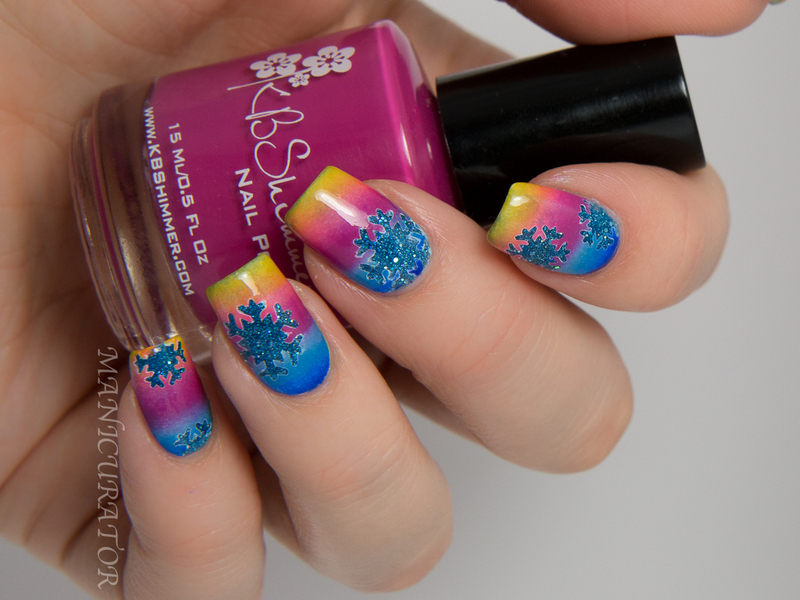 This certainly is the most creative and artistic rendition of snowflake nail art I've ever seen!! 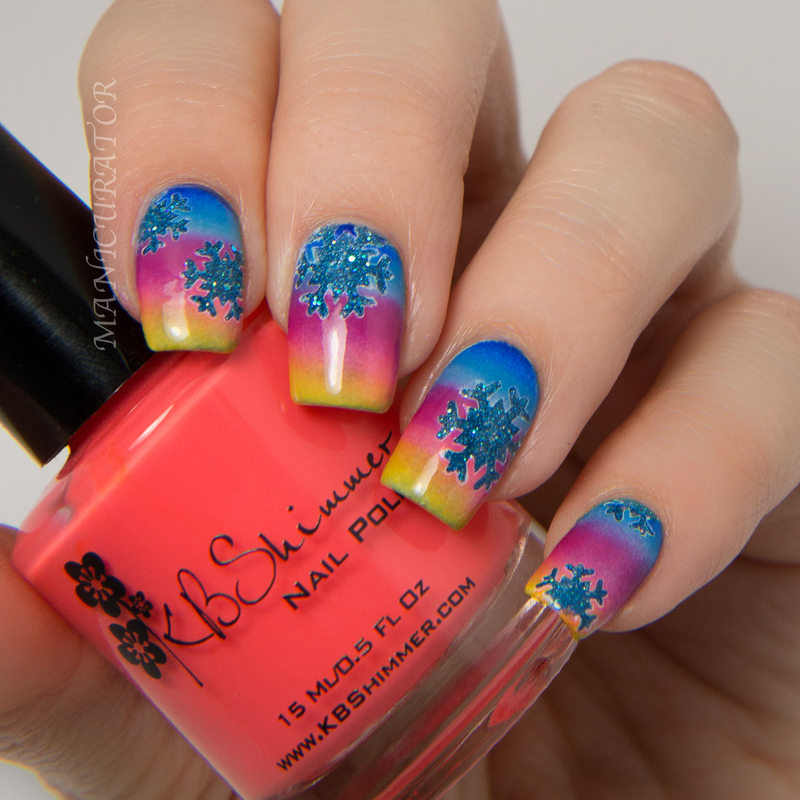 Gorgeous gradient! How did you get such clean lines? You are too kind!! But thank you!! I got kind of giddy watching them unfold and turn out exactly as I hoped they would! Oh wow this is spectacular! So creative! 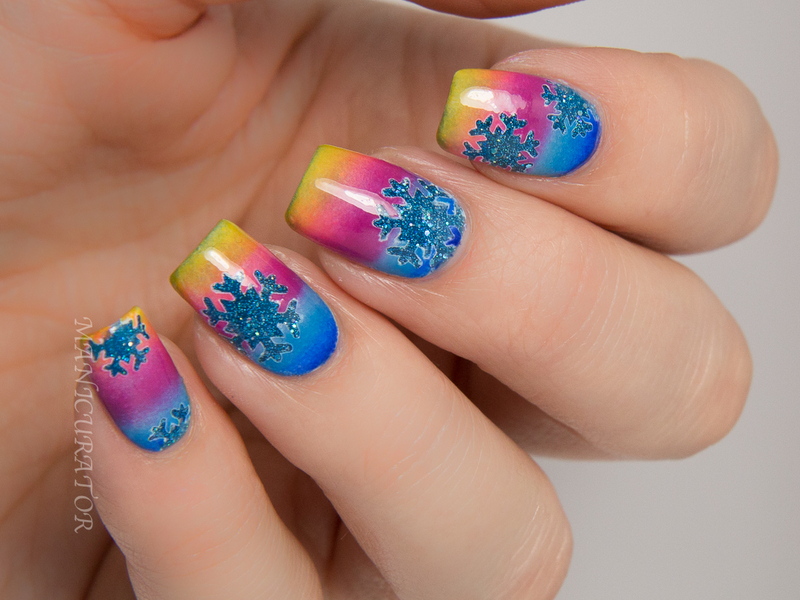 The gradient looks so amazing and the snowflakes are perfect! My goodness this is an absolutely gorgeous mani n u did a perfect job recreating the picture. The colors everything is just flawless! Wow! 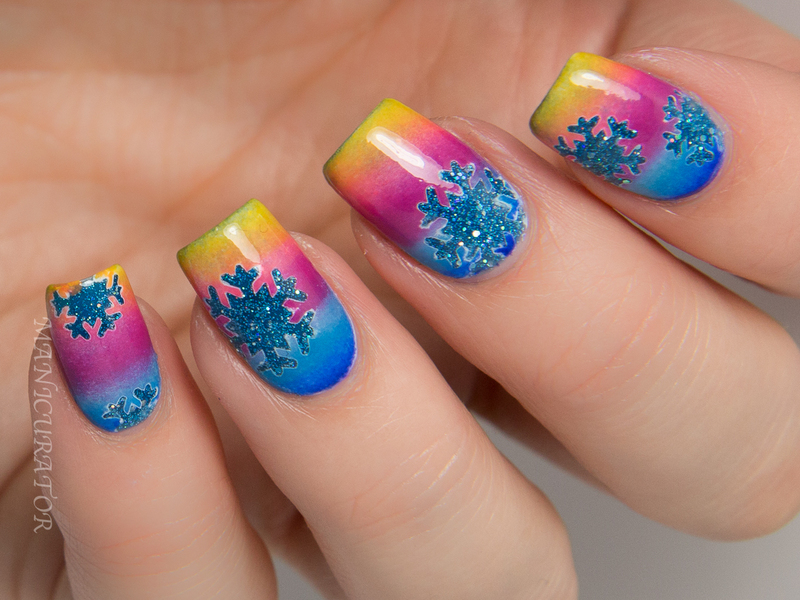 This is stunning ... such a different, winter manicure and so gorgeous! I'm not surprised you had a hard time choosing pics :) I love the mix of techniques and the effect you've achieved with the snowflake vinyls. Really, really beautiful! That gradient!!! And I looooove the sparkly blue snowflakes. Stunning! Oh, no, I meant the gradient itself. I like the crispness! This looks absolutely stunning! I love the effect of the glittery snowflakes! That gradient is FLAWLESS! What a unique look, I love it! P.S Now that I see KBS You're So Shellfish, I NEEDS DAT!! !